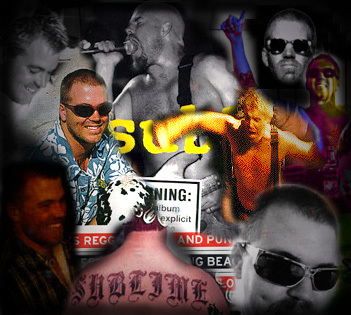 Brad was the lead singer and guitarist of the band Sublime. He was a brilliant man and I was shocked when I heard the news. Instead of remembering how he died, I think it is more important to remember how he lived. Brad was full of talent, emotion and music. Every song seemed to come straight from the heart. People often say that his music was about drugs and depression, I disagree, to me it was about life and how to live. I think we can all take it for our own personal meanings, which is why it is so great. We'll miss you Brad! Remembrances of Bradley James Nowell by Jim Nowell, Brad's father. Remembrances of Bradley James Nowell by Jim Nowell, Brad's father. May 27, 1996 Brad was a loving son, who always had a hug and an "I love you" for his father. He was very open with his emotions and told me that his wife, Troy, and eleven month old son, Jake, were his special joys in life. He also had a special place in his heart for both Nancy and Janie, both of whom he called mom. He loved his sisters Kellie, Katie, and Kristin, his brother Cory, his Uncle John, and Aunt Karen. He had a special relationship with his Aunt Julie. He loved his Grandpa Louie and Grandma Mackie, in fact so much so that he named his dogs after them. He and his dog Louie were inseparable. Where ever Brad lived or traveled Lou Dog was there even sharing his last moments with him. He greatly enjoyed all of you in his large extended family and considered you not only as cousins, but as friends in his life. His was a tender and generous soul that cared more for the welfare of others than the material treasures of life. He often expressed the love and admiration he felt toward his band mates, Eric and Bud, who he thought of as brothers. Alas, Brad was, as all young men are, a seeker of truth and perfection, both in his life and his music. We had many a conversation over the years about the meaning of life and our place in it. He read through my shelf of used books that I acquired during my questioning early years, and he used to go through used book stores in his own search. Brad sought wisdom by reading the old philosophers and biographies of great men. He read the books of Joseph Conrad and dreamed of south seas adventures. He read accounts of man's history in search of understanding our world. He sought for the wisdom of the universe in an imperfect world only to find that man is fated only to ask the questions, the answers to which are known only to God. He looked to expand his mind and seek escape in drugs, but came too close to the edge with them and unintentionally took his own life. Brad will always live for me in his son, Jake, and we can all seek relief from our grief by loving and nurturing the son he gave us. Brad touched many people with his caring personality and musical genius and we are all lucky to have had him in our lives. Men who have lived longer have achieved less and I am content that he is now at peace. This Sublime Collection site is owned by Keegan Beinhower.